Busch Garden Williamsburg Hotel Packages: Worth it or Not? Like...a timeshare sales pitch. Yeah, one of those. To receive the Busch Garden military discount, simply register, either online at www.wavesofhonor.com or in the entrance plaza of a participating park, and show a Department of Defense photo ID. Veterans can get their 50% off deal by going to the same site. We scoured the internet investigating Busch Garden Williamsburg hotel package deals, and found one fact: the better the deal, the more likely that you'll have to sit through a timeshare sales pitch to get it. Not that all of these hotel packages are fronts for timeshare presentations. But if it sounds too good to be true (for example, two night's stay for two for $100), then they're probably able to offer the deal in exchange for you sitting through a timeshare pitch. 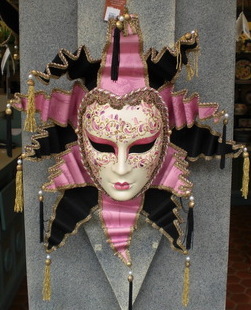 You can buy these beautiful Carnivale masks in the Italy section of Busch Garden Williamsburg. If you're considering it, keep in mind that some of these pitches can last up to two hours, although they'll probably tell you it'll be less. So you will have to give up some of your valuable vacation time. For some of you iron-clad deal chasers, that's no problem. If you see resisting timeshare pitches as a challenge, be our guest and take the deals! For the rest of you, here are some of the facts. 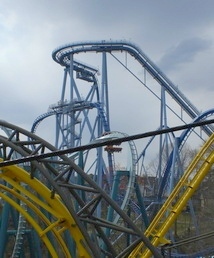 From old to new, with the Loch Ness Monster in the foreground and Griffon in the background at Busch Garden Williamsburg. I have no problem with groups that are offering an even, open exchange-- "You give us two hours for a timeshare pitch, we'll give you this deal." I take exception to groups that try to trick you into a deal. For example, I found a package advertised on "discountthemeparkvacations.com." It looked just like the official Busch Garden Williamsburg website and offers TWO Busch Gardens 1-day Passes for only $25. Sounds great! So I called to check it out. In talking to them, I found out that "all" you have to do to get the Busch Garden Williamsburg deal is spend at least one night at the Williamsburg Westgate Resort (includes a "free VIP buffet breakfast") and pick up your discount tickets. "Reservations based upon availability and good to 2 adults and up to 2 children. Offer limited to individuals between the ages of 30-68 with an annual household income of at least $50,000, and must attend a 90-minute sales presentation...Failure to qualify and attend the sales presentation will result in a penalty equal to the retail cost of your vacation package..."
So should you avoid all Busch Garden Williamsburg hotel packages? Absolutely not.My parents went to Kawaii, stoically sat through a 90-minute timeshare pitch, bought nothing, and were rewarded with a free helicopter ride over Waimea Canyon (well over a $100 savings). It CAN be done (it depends on your will power!). Just be aware of what you're getting yourself into. 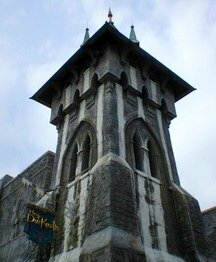 The Curse of DarKastle in the Germany section of Busch Gardens. We checked out a www.williamsburgvacations.com package deal. It offered two nights lodging at the Days Hotel Williamsburg Busch Gardens Area (June 7 and 8) as well as tickets for two adults to Busch Gardens and Water Country USA. Price: $400. So is that a good deal? Well, I decided to go directly to the Days Inn website (http://www.daysinn.com), and saw that the price for those two nights was about $268. Two 2-Park passes for June totaled about $100, for an overall cost of $368. Not as amazing a deal as it seemed, is it? I also used to recommend package deals offered directly by local hotels, such as one offered by Country Inn and Suites by Carlson which included accommodation, daily breakfast, $10 in meal vouchers, and two tickets good for both Busch Gardens and Water Country USA starting at $180 per night. But these days, most local hotels are NOT offering deals like this, or the packages they are offering really don't save you any money. Summer Family Fun Time Package - 7 day tickets to Colonial Williamsburg, Busch Gardens, and Water Country USA, free parking at the park, a dining certificate at the park, and accommodations (plus daily breakfast at some hotels). Prices vary by the hotel you choose (you can go cheap like at the Williamsburg KOA Campground, or more expensive, like at the Kingsmill Spa), and by how many nights you want to stay. For example, a two night package stay at the Williamsburg KOA Campground might start around $199 per person. Even if you don't purchase a package deal, you can always go ala carte and get Busch Gardens Williamsburg discount tickets. My Busch Gardens Discount Ticket Page will show you how to save anywhere from $15-$22 per single-day ticket. For details on single-day ticket discounts and deals, go to my "Deals & Admission Facts" Page. Want a deal on season passes or a combo ticket that will get you into Busch Gardens, Water Country USA, and Colonial Williamsburg for one great price? Click here for details on the Williamsburg "Bounce" Ticket.